Get ready for your summer barbeque with a quick and easy caddy for your silverware. 1. 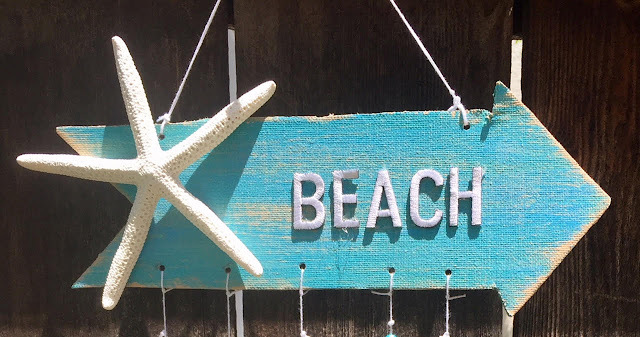 Sand and paint wood pieces with acrylic paint then dab with chalk paint. 2. 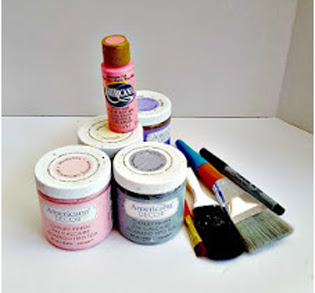 Paint canning jars with chalk paint. Distress by rubbing lightly with sandpaper, or sanding sponge. 3. 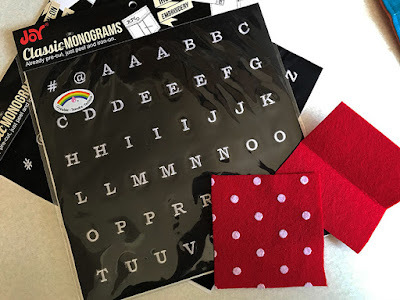 Arrange the letters on tags then adhere with a craft iron (lo-temp, or tacky glue). 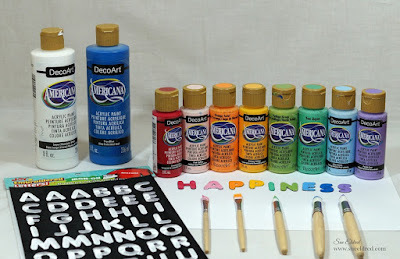 Add paint to letters if desired. 4. Tie tags to jars with ribbon or fabric strips. 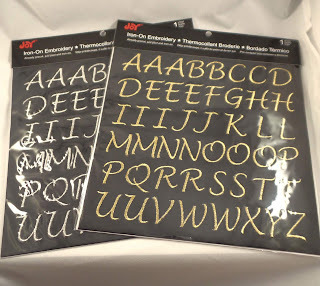 Look for Joy® embroidered letter sheets at your favorite craft stores! Create fun personalized scarves for your fur babies! 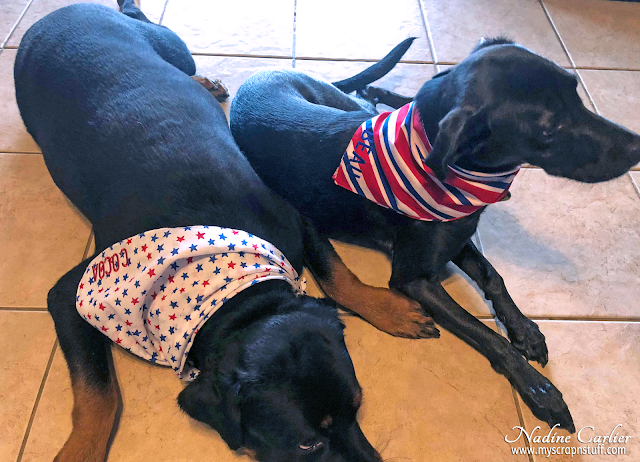 These are quick and easy to do, the hard part was to get my dogs to hold still long enough to take their picture. 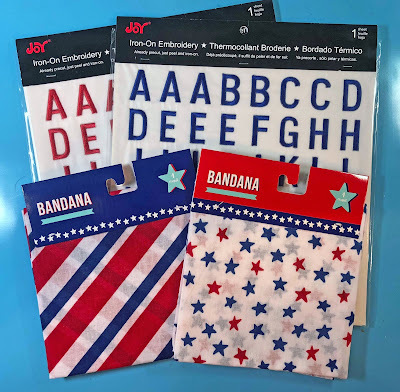 Arrange the Joy® iron-on embroidered letters on the scarf then iron in place following the instructions on the back of the package. It's so easy! 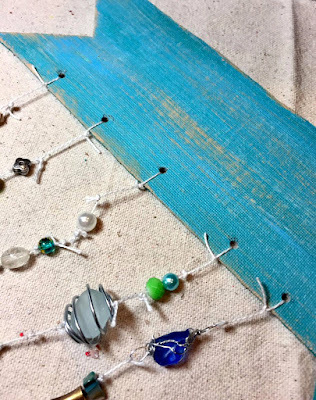 I'm fortunate to live close enough to the beach to visit often, so the shells and sea glass used in this project are from my many walks along the shore. Enjoy! Thin canvas panel or thick cardboard. 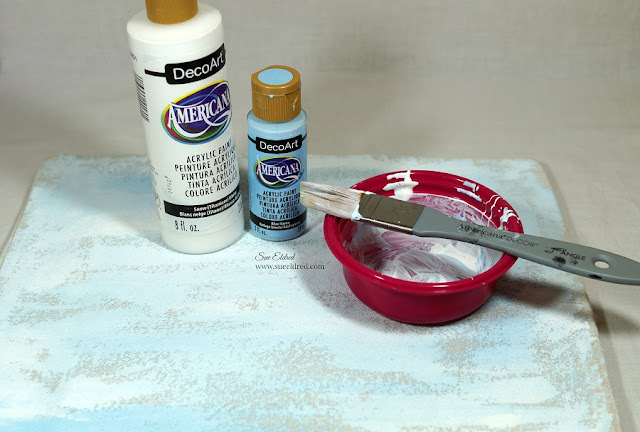 Acrylic paint in blues and light browns. Foam brush and dry bristle brush. Pencil, scissors, glue gun and heavy duty hole punch. White twine and wire for wrapping. 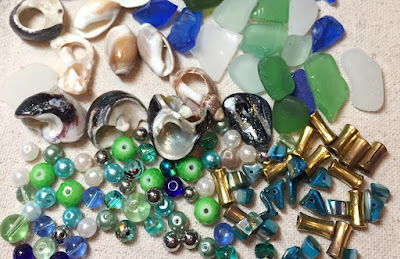 Assorted sea shells and sea glass. 1. Determine the size for the arrow. Sketch the design onto the canvas, then cut out. 2. 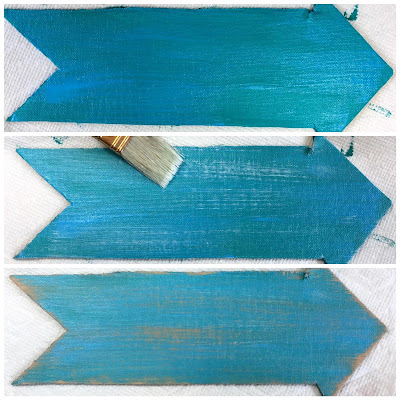 Paint the arrow with the blues first and let dry completely. Using the dry bristle brush, gently sweep some of the gesso across the sign. Let this dry then add some brown with the same dry brush to create a weather worn look. 3. If you like the 'dry' look for the sea glass and the 'wet' look for the shells, paint the shells with some clear nail polish with glitter in it. This is totally optional, it all depends on your personal style. 4. Working in sections, thread the beads, knotting them in between. Wire wrap some sea glass here and there and add them to the mix. 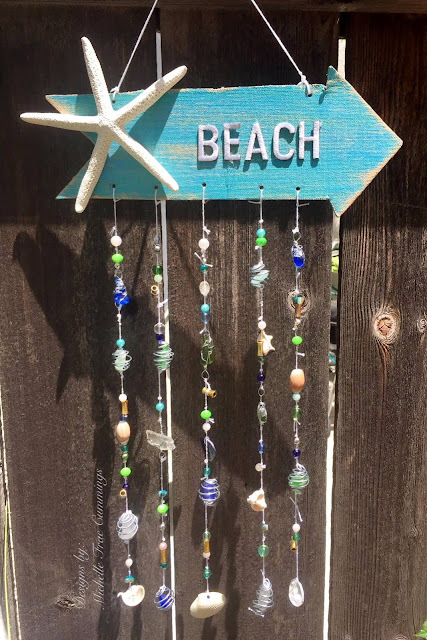 If wire wrapping is not your thing, the craft stores sell all sorts of ocean themed charms for your sign. 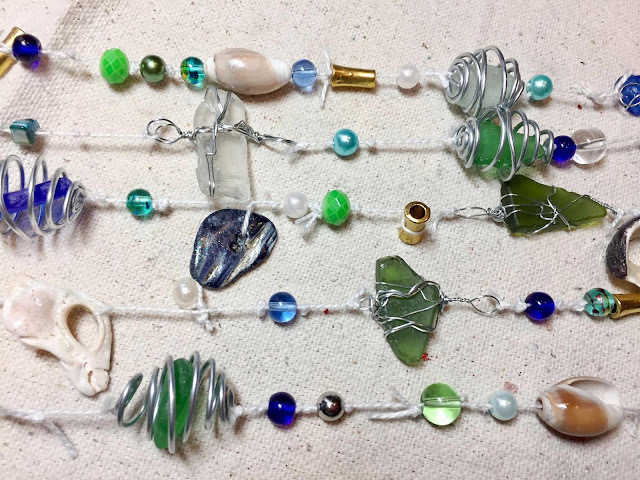 You can also find sea glass at any craft or hobby shop. There is really no right or wrong way to do this. The finished length of each strand measures about 12"
5. Make holes in the canvas with the punch then tie your strands in place. 6. 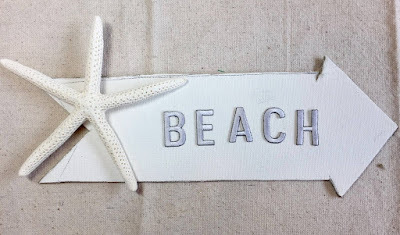 Add your letters and starfish with hot glue. Keep your sewing needles organized with this quick and easy to sew needle case. 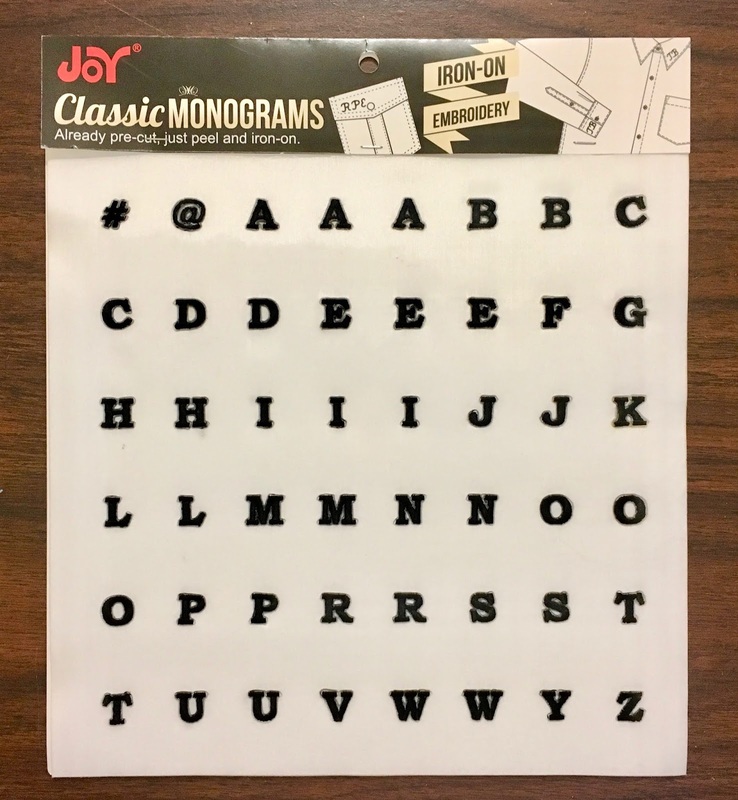 Spell out the word, STITCH with the Joy Classic Monogram Letters. 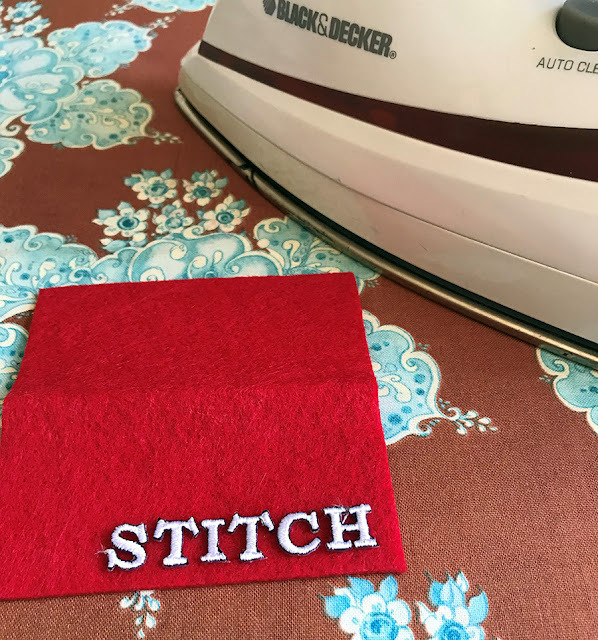 Position the letters on the felt then press with a hot iron. Be sure to use a pressing cloth! 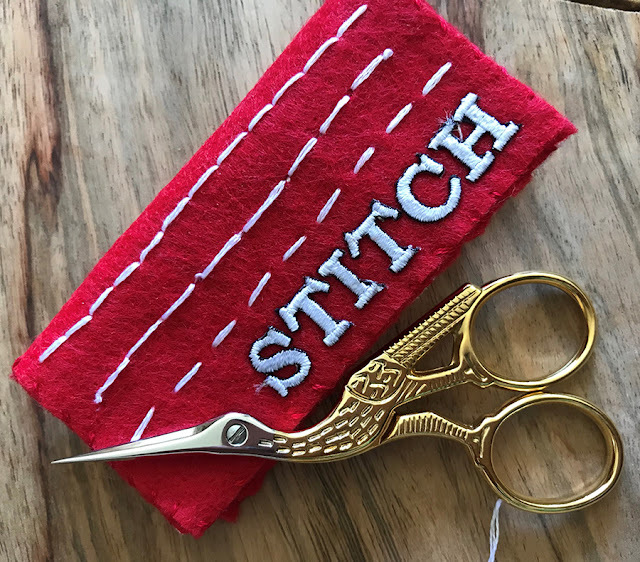 Once the letters are in place, draw three straight lines above the word, then use embroidery floss and thread to stitch a few different stitches across the line. I used a Backstitch and a Running stitch. Once you have finished stitching, place the front and back pieces of felt together, with the monogrammed and stitched side facing up, then whip stitch the pieces together. Fold in half. Press (using a pressing cloth again) along the edge of the fold. You can find Joy® embroidered iron-on letters and letter sheets at your local craft store. 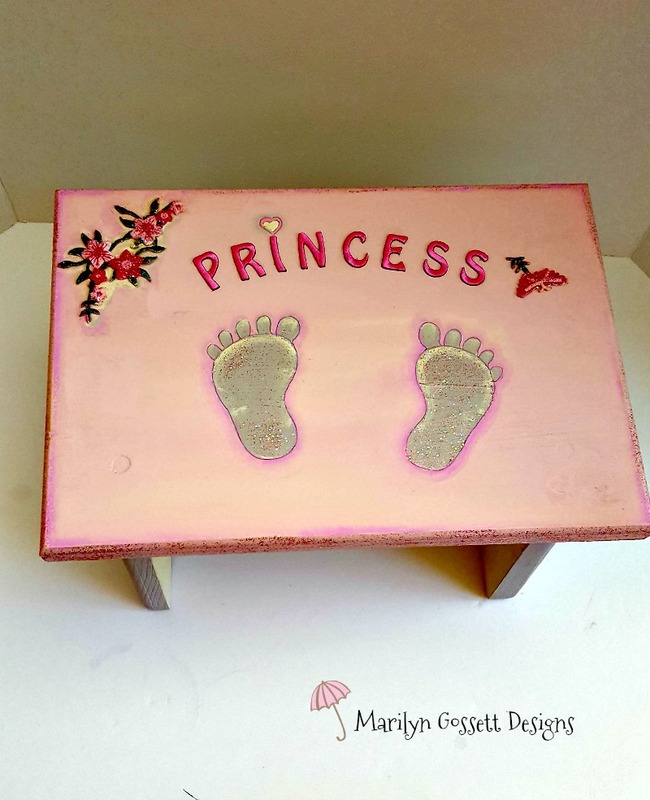 When your little princess needs a boost, make her a small step stool and personalize it with Joy letters and embroidered, floral embellishments. 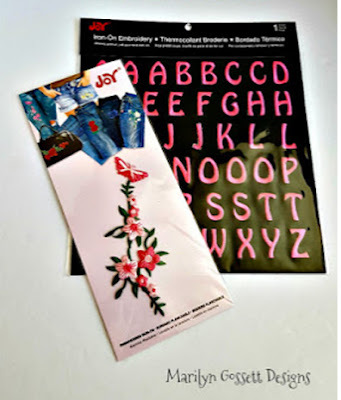 Joy® iron-on letter sheet - dark pink; 1"
brushes: 2" flat brush; 1/2" angled brush; stencil brush; scrungy one for applying glitter paint. Sand the wood then wipe clean with a damp cloth. Apply cream colored base coat to the stool. Let dry then paint the top of the stool pink and the sides gray. Let dry. Use the angle brush to apply evenly spaced pink stripes to the cream painted area of the stool, below the top. Let dry. 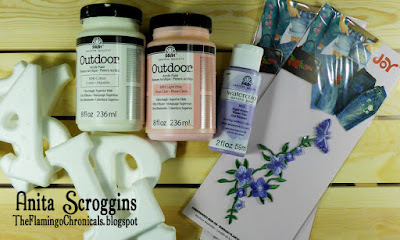 Attach the stencil to the top of the bench then paint each foot gray. Apply a little pink around the outside edges to shade and cream on the inside edges of the feet to highlight. Add details by drawing a line around the feet using the permanent marker. Draw lines on either side of each stripe to give them further definition if desired. 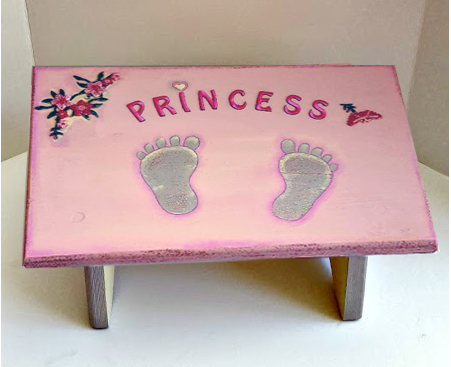 Apply pink glitter paint to the edges of the top of the stool and the inside edges of the feet. Apply one or two coats of sealer to the entire project. Let dry thoroughly after each coat. Cut the butterfly from the flower appliqué then glue the flowers to the upper left corner of the stool. 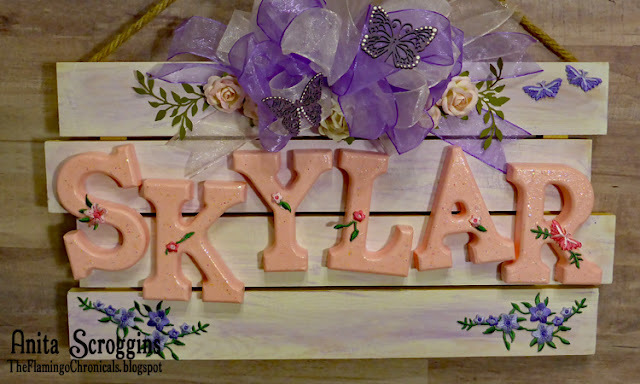 Arrange then glue the letters to spell princess as shown below then add the butterfly. Enjoy! 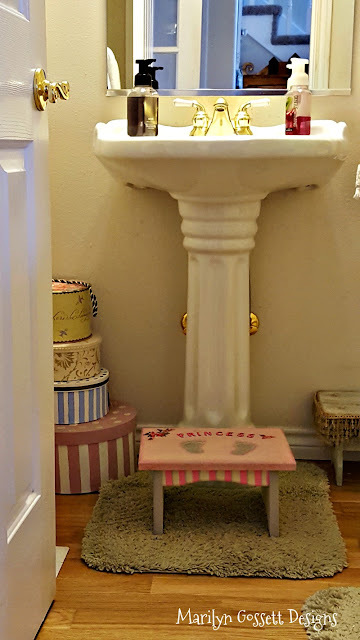 This step stool is worthy of a little princess who needs a boost. Of course it can be designed for a boy by changing the colors and using letters to spell name, PRINCE, etc. You can find a a wide variety of Joy® embroidered letters and appliqués, perfect for adding special touches to your projects. Quick and easy! 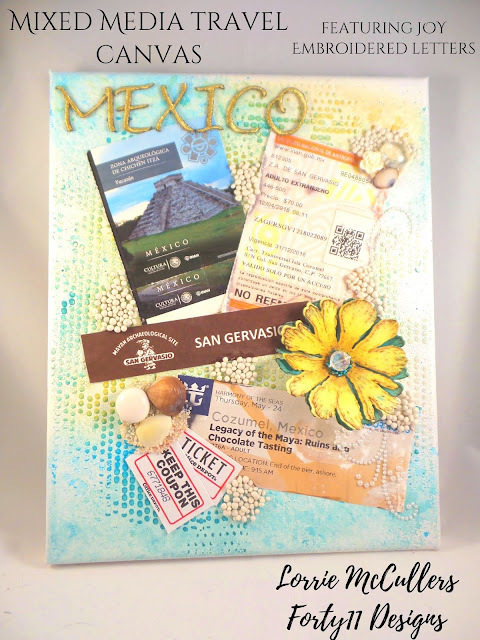 Turn your travel ephemera into a gorgeous canvas! 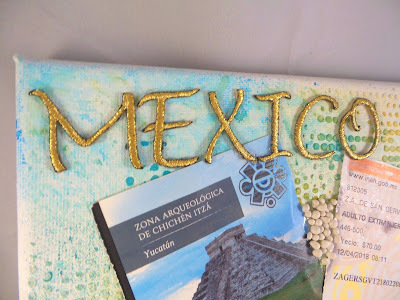 Apply travel ephemera and embellishments with either liquid glue or hot glue gun. 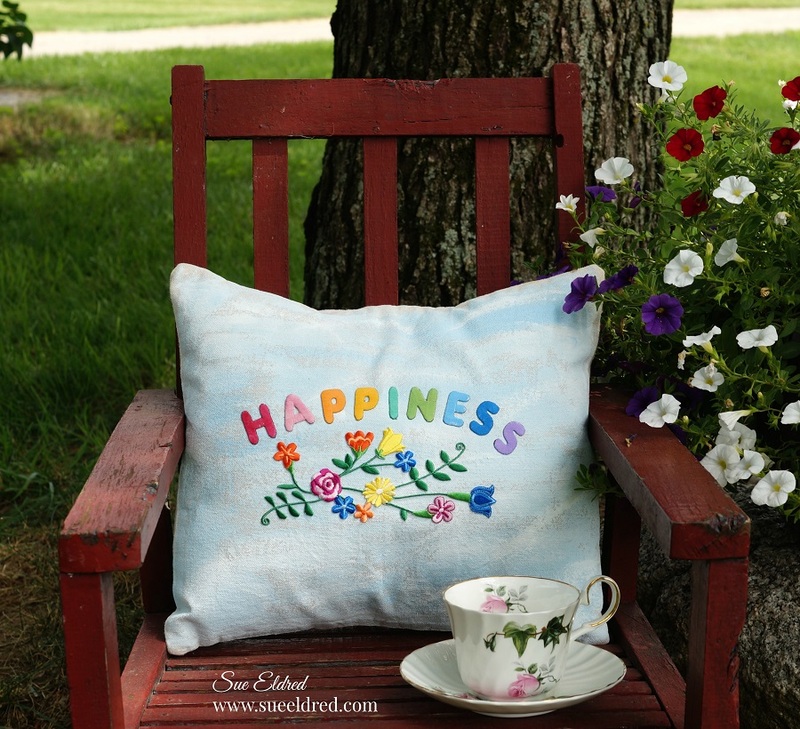 Finish the canvas by applying the embroidered letters to the canvas with liquid glue or hot glue gun. 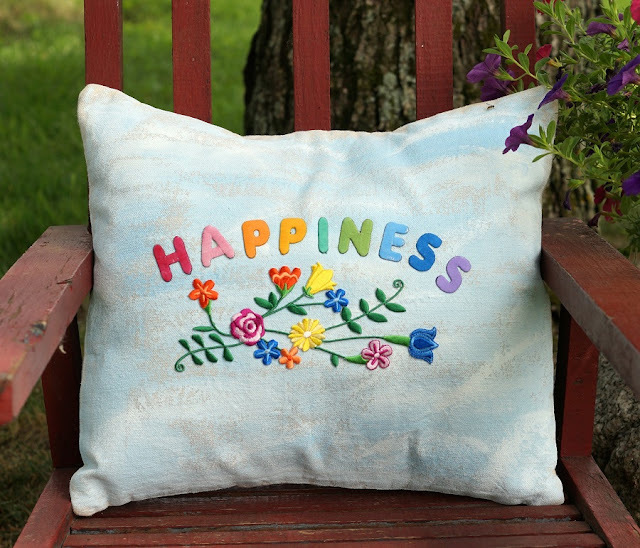 The embroidered letters will give your canvas more dimension and texture than regular stickers! Joy® Iron-on embroidered letters in white are great for creating any color you can imagine! 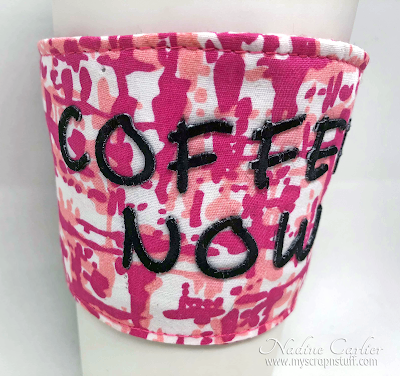 You can use dye, markers and even acrylic paint! 1. 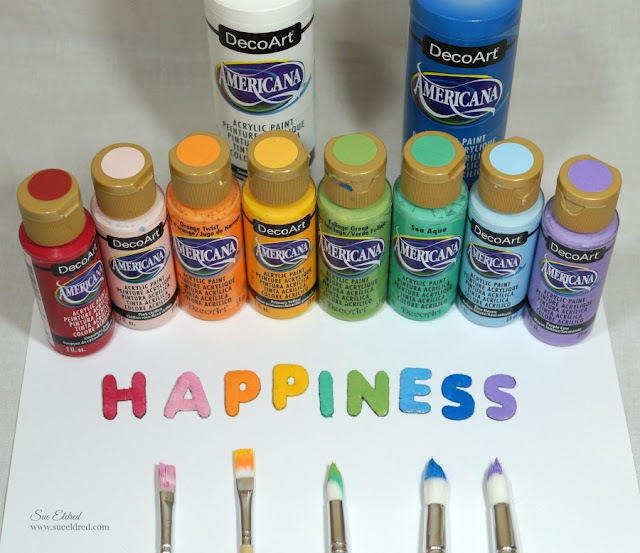 Paint each letter to create a rainbow of H-A-P-P-I-N-E-S-S. Set aside and let dry. 2. 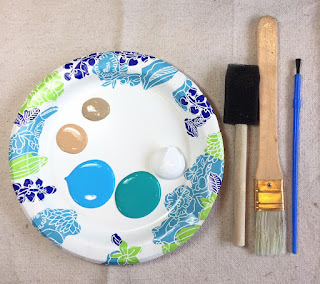 Insert cardboard into pillow blank then paint the pillow with white and light blue paint. Let dry. 3. Set iron on cotton setting; approx. 350 degrees, or follow garment care label. 4. Position the letters, shiny side down on the pillow then, following package directions, cover with a pressing cloth and iron in place. 5. Turn pillow over and iron the back for another 30 seconds. 6. Iron the floral appliqué onto pillow in the same manner. 7. Allow to cool for about one minute before handling then insert either a pillow form or polyfil. 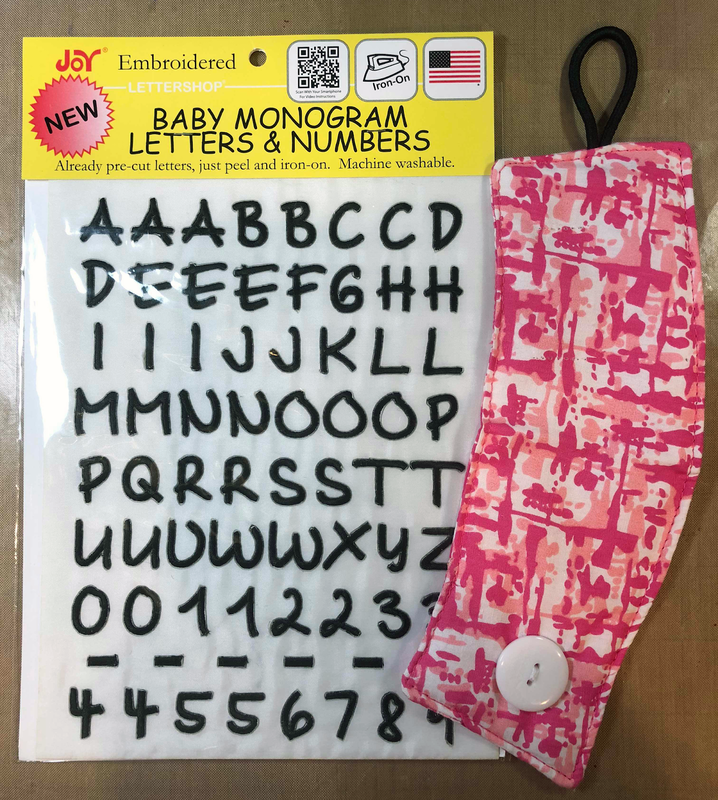 Look for Joy® iron-on embroidered letters, numbers and floral appliqués at your favorite craft store. Letters are available individually and in sheets in different sizes, colors and fonts, suitable for every occasion. Ready for some super hero fun? 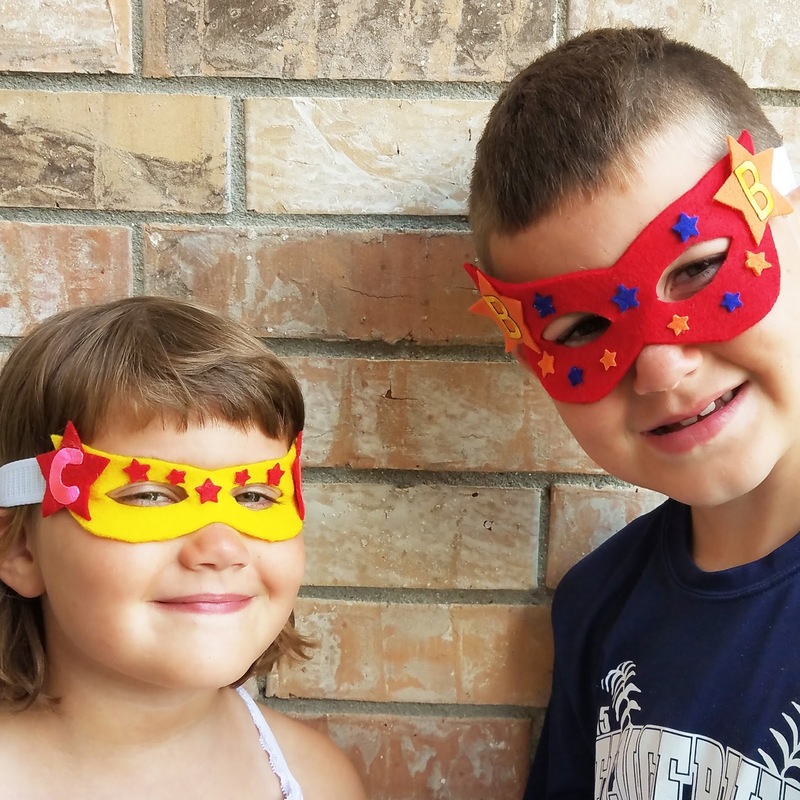 Let's make some super hero masks to bash those summer days away! 1. Trace out the shape of the mask on the felt and cut it out. 2. Cut out the star shapes from the felt, making sure 2 of the shapes are large enough for the letters in fit. 3. 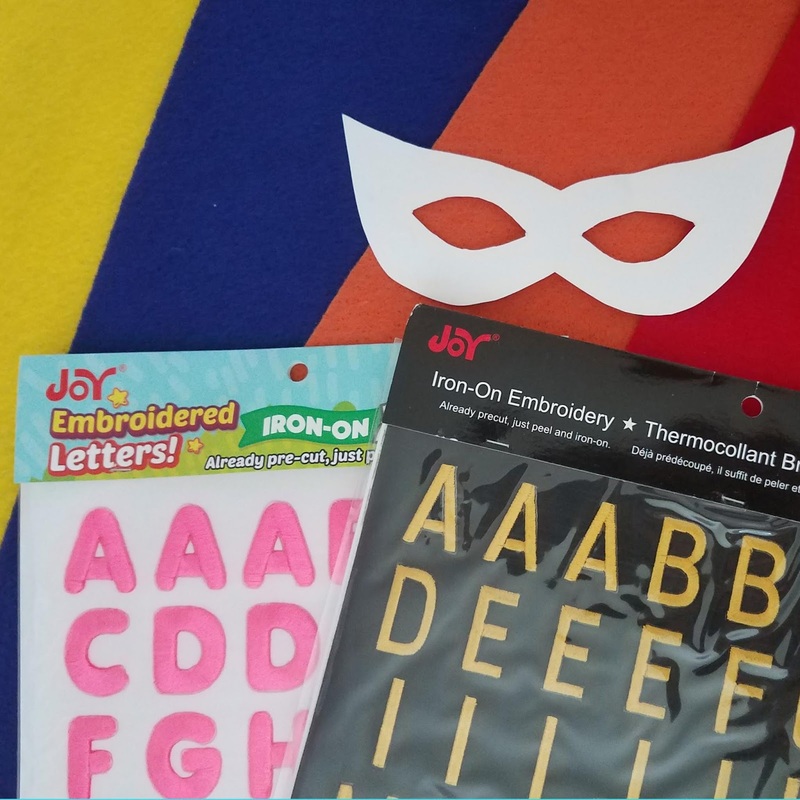 Select the letter you wish to be on the mask, the first letter of the child's first name is always a win, then iron on to the felt following the directions on the back of each package. 4. Glue or sew the stars to the mask. 5. 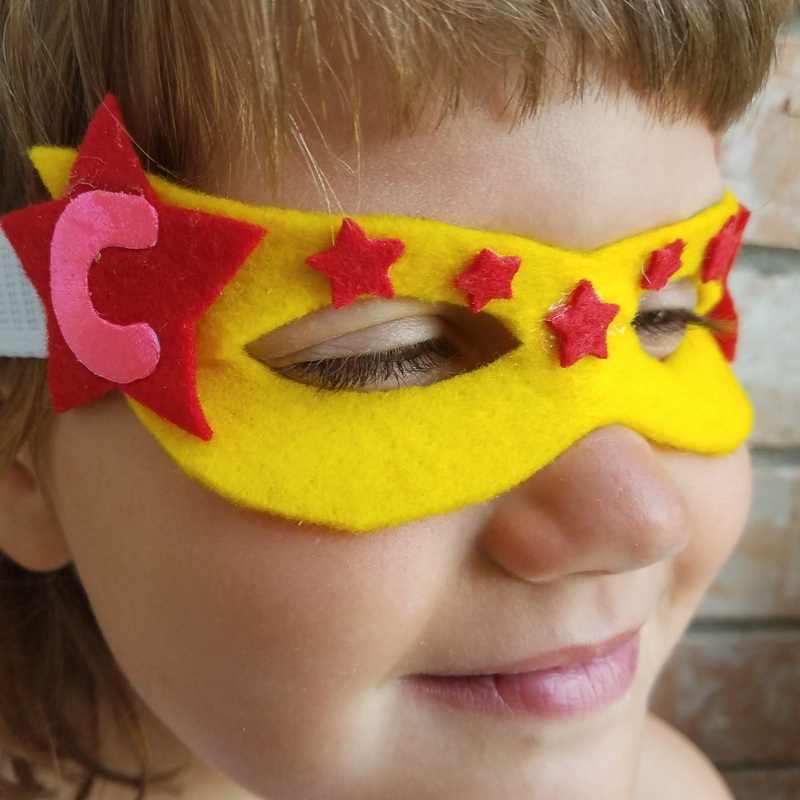 Attach elastic to the mask to fit child's head. 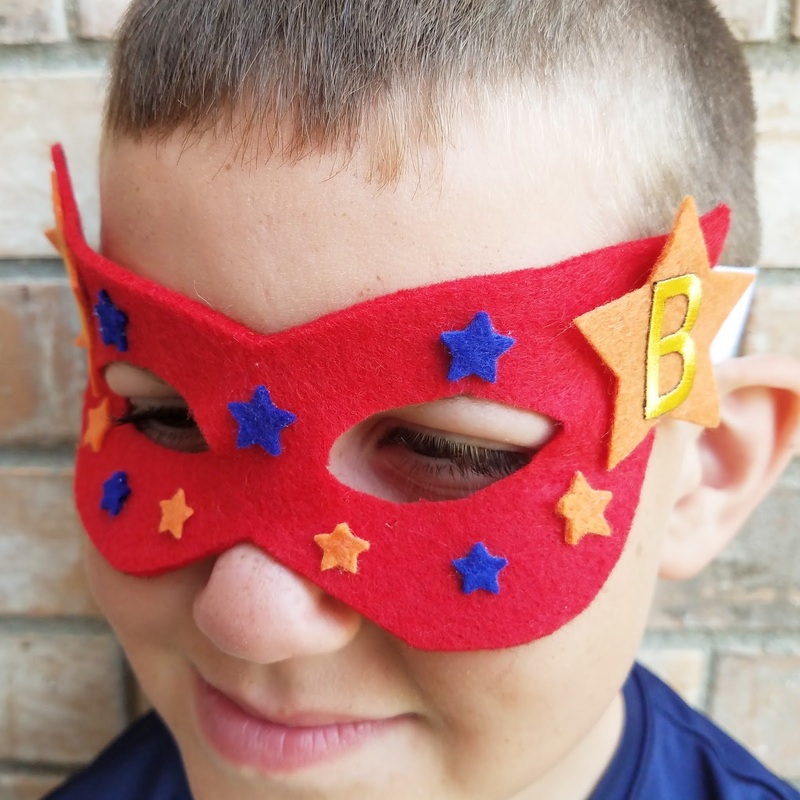 Enjoy this short video on how to make these fun personalized masks!! Moving into a new house is so exciting, especially when it's your daughter's first one. 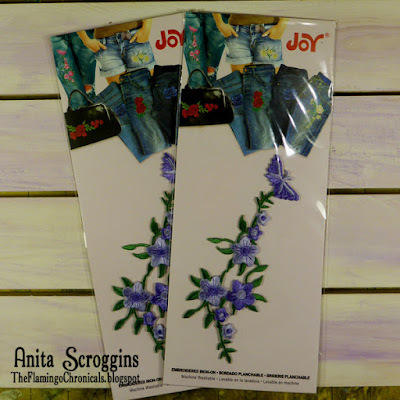 Personal touches are a must, so I created a floral door sign for my granddaughter's room using the new, floral embroidered iron-ons from Joy®. Look how pretty they are! 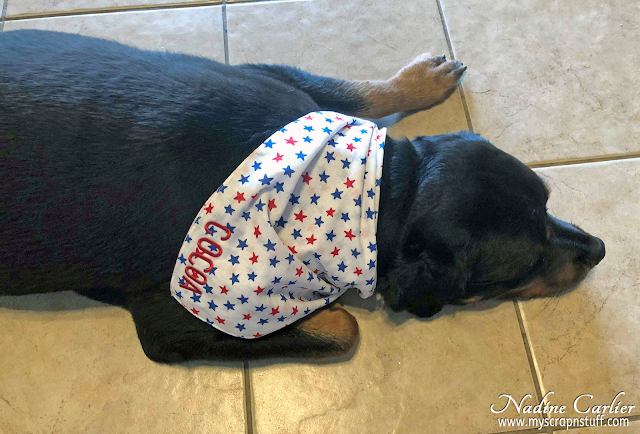 There are several new varieties in different colors and designs and they work well for both fabric and craft projects. 1. Paint the sign and the letters. Let dry then adhere the letters to the sign. 2. 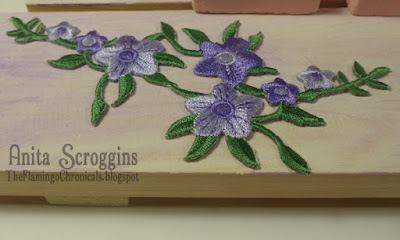 Add the iron-on embellishments with lo-temp glue. Trim the iron-ons if needed for a better fit around the letters. 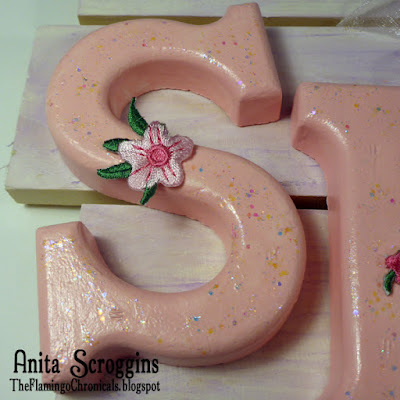 Glue smaller elements from additional floral iron-ons to the letters. 3. 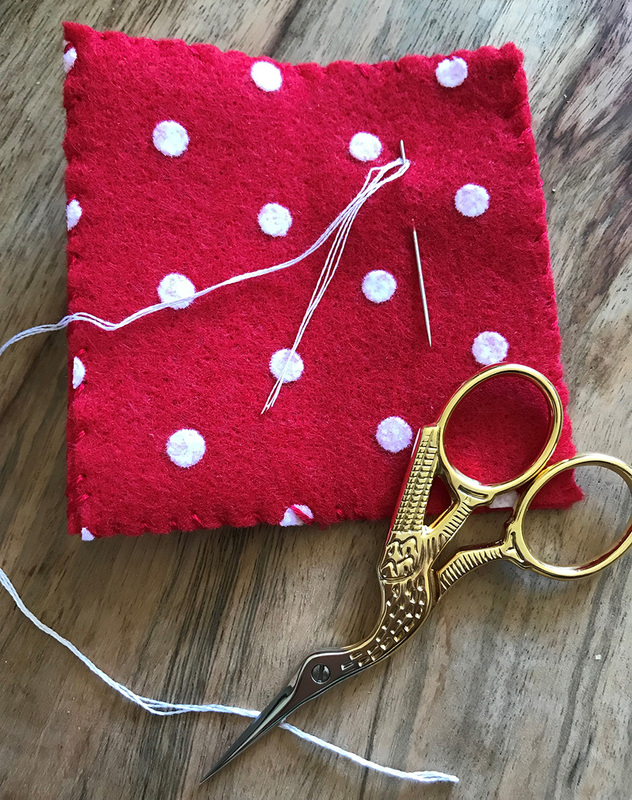 Add a bow and additional embellishments if desired. 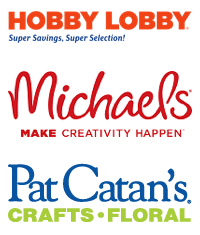 Look for Joy® Iron-on embroidered letters, letter sheets, numbers and florals at your local craft stores. 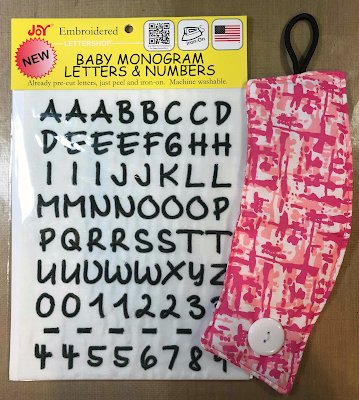 Letters and numbers are available in a variety of sizes, fonts and colors. 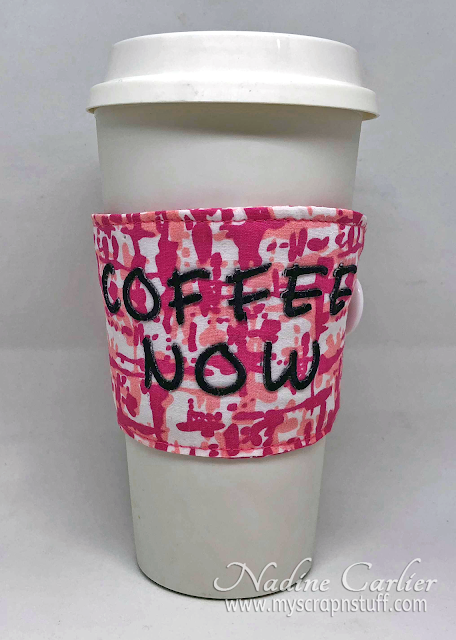 Create a custom coffee cozy with a fun saying as a gift or for yourself. 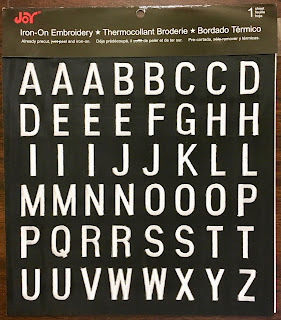 Arrange the Joy® iron-on embroidered letters on the cozy then iron in place following the instructions on the back of the package. It's so easy!